Flat Roofing: Industrial and Commercial. 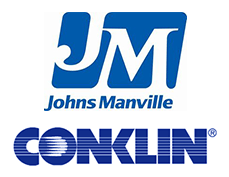 We only offer TPO and PVC roofing systems by Conklin and Johns Manville. Polyvinyl Chloride (PVC): One of the pioneering single-ply roof materials, PVC sheets contain plasticizers and stabilizers as well as other additives to impact flexibility and achieve other desired physical properties. PVC roofing can be made to fit nearly any flat roof shape, and is considered a fire-safe material. Due to its durable composition, this material is highly resistant to punctures and tears normally experienced by most commercial roofing membranes. We at ArmorGuard believe PVC is the best modern day roofing system for low sloped roofing on the market today. Thermoplastic polyolefin (TPO): A thin, rubberlike single ply sheet membrane material that’s been used for roofing commercial and industrial structures. The raw TPO is mixed with material to resist wreathing and fire and white pigments for color and then rolled into a thin sheets that are bonded to the top and bottom of a polyester fiber core to make roofing material that can withstand the elements. TPO single-ply roofing membranes are among the fastest growing commercial roofing products and have gained broad industry acceptance for their many performances and installation advantages. It’s perfect for new construction or re-roofing where superior performances is required at a cost-effective price.